It is a common trope in several films and TV shows that during the Cold War, the leaders of the USA and Russia each had a red telephone on their desk through which they could directly communicate. In reality this "red telephone" never existed - the two countries communicated through secure teletype from 1963, then fax from 1986, then finally email from 2008. The US transmissions were always sent from the Pentagon, never from the White House desk. According to one US Army translator, the idea of the "red phone" may have come from the Pentagon, where one general had on his desk a red telephone through which he had a direct connection to the White House - an account seemingly backed up by this blog, which states that red phones were used in the early days for internal communications rather than international communications. The link wasn't completely direct either; it used the very first TransAtlantic Cable (TAT-1), which connected Washington to Moscow via London, Copenhagen, Stockholm and Helsinki. The London portion ran through the "Kingsway Tunnels" (or "BT Tunnels"), built during WW2 to serve as bomb shelters and military headquarters. The connection was cryptographically secure but at times the actual physical cable was not; it was reportedly severed twice by bulldozers, driven by farmers in Denmark and Finland respectively, while it was once knocked out of action by a fire down a manhole in Baltimore. Luckily, they also had a backup line via Tangier in Morocco. To minimise the potential for misunderstandings, the communications were always done electronically and never verbally, with each side sending the transmission in their own language. Both sides each had encoding machines in the Latin alphabet (for English) and the Cyrillic alphabet (for Russian). These were made for both countries by a company in neutral Norway, to minimise the risk of sabotage by either side. Which reminds me of something. The North Korean loony claims to have the nuclear button on his desk at all times. Even for him I find it very difficult to believe. At best he probably has a direct line to the military bods who will carry out his order to push the (probably theoretical in any case) button. Assuming it's not all just political chest-beating - either that, or it's on his desk but in a clear box with "Break glass in case of Trump-induced emergency" written on it. Or it's some kind of elaborate key system like in GoldenEye. But you're right, I can't imagine he's just got a big "destroy" button on his desk like Homer Simpson does. Mythbusters also tested this theory and came to the same conclusion - mobile phones won't cause a petrol station fire but static electricity definitely could. They interview an American petroleum expert in this video () who goes into the exact science behind static ignition at petrol stations. 1. When was the first prank phone call? "A GRAVE JOKE ON UNDERTAKERS -- Some malicious wag at Providence R.I. has been playing a grave practical joke on the undertakers there, by summoning them over the telephone to bring freezers, candlesticks and coffin for persons alleged to be dead. In each case the denoument was highly farcical, and the reputed corpses are now hunting in a lively manner for that telephonist." In the US this was a big nuisance on April the 1st for some numbers with some disconnecting their lines or some like Chicago Zoo taking it one step further with their "phone operators set up a gramophone so that callers asking for Mr. Lyon were promptly hit with an ear-splitting roar through their handsets". 2. 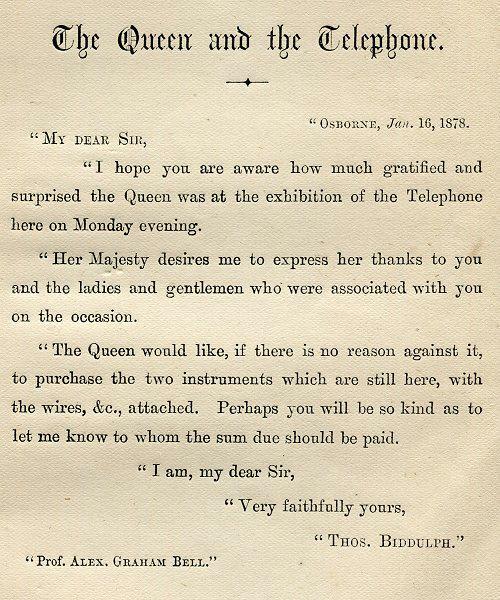 In 1878 Queen Victoria received an interactive demo of the workings of the telephone from Alexander Graham Bell. The queen was impressed with songs sung down the phone to her but in the report on this blog this blog from the British Newspaper Archive she does not seem to speak on this occasion - with the Duke of Connaught returning the queens thanks. Hat tip to the BPS research digest for summarising these two studies and basically doing any form of effort for this! The North Korean loony claims to have the nuclear button on his desk at all times. Even for him I find it very difficult to believe. At best he probably has a direct line to the military bods who will carry out his order to push the (probably theoretical in any case) button. I cannot speak for the "North Korean loony". But while it doesn't launch nuclear missiles, President Trump does have a red button on his desk. It summons his personal attendant, and it is said that the usual reason for pressing it is that he requires more Diet Coke to be brought. The precise process by which the President orders the launching of nuclear missiles is understandably not made public, but he would start the process by asking for the "football" to be brought to him. The football is actually a briefcase, and while the President is never left alone with it, it is never more than one room away. Inside the briefcase are a number of lever arch files. They contain information on the practicalities and consequences of various nuclear attack scenarios, and instructions (supposedly they change every day) for contacting the official at the Pentagon who would actually oversee the launch. But no big red button. The Beeb has a detailed story on this today. It also says that Bill Clinton managed to lose the nuclear codes. He kept them in the pocket of his trousers, which must have been hazardous given his casual relationship with his trousers. Sorry if this is common knowledge, I only heard about it the other day and just remembered that phones go in phone boxes... still not adjusted to 2018! 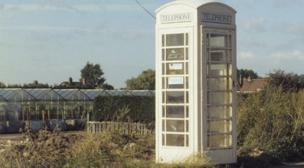 Those are the phone boxes I grew up with! Kevans: I'm not sure if it's common knowledge but it has been mentioned here twice before. It was actually 1999 when Kingston upon Hull City Council sold 59% of Kingston Communications plc (now KCOM Group plc) for around £260 million. What happened in 2007 was that the City Council sold off the 41% that it had initially retained, and ceased to be a shareholder in the company. BT does by now offer telephone services to business customers in Hull (and Beverley, which was traditionally also Kingston Communications territory), but not as yet to residential customers. Residential customers can't have wired broadband from anyone other than KCOM either. There is apparently some kind of local agreement covering football and rugby league matches involving teams from Hull, since even Sky and BT Sports accepted it as not quite right that people in Hull couldn't otherwise watch their own city's teams, but that their broadband is both the slowest and the most expensive in the country is a common complaint from Hullensians. Shirley, this should wait for the T series, under Telephones? Shouldn't it be 'phones, like 'planes? I often see that apostrophe appear when nouns are abbreviated. Apparently not, according to this article from University of Sussex. Since these types of words are considerd "clipped forms" rather than contractions, they do not require an apostrophe.